TV-radio host and biker Love-Love Tioseco was the celebrity guest for the Meet-and-Greet portion of the event, and the participants had the opportunity to have their photos taken with her. Finally, the program concluded with a short presentation on the dangers of riding under the influence of alcohol. In an interactive demonstration using FatalVision goggles, the Safe-T-Ryder team simulated the effects of drinking on visual perception and the damaging consequences that can result in injuries and even death. 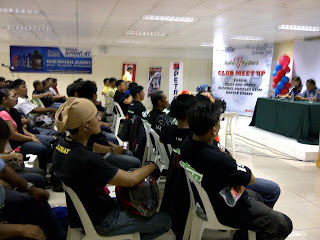 The range of Petron Sprint 4T motorcycle oils was also introduced to the participants, with an overview of their specifications and uses. Formulated to meet the different performance requirements of four-stroke motorcycles operating under moderate to severe driving conditions, Petron Sprint 4T is available in three variants—Sprint 4T Enduro for racing, Sprint 4T Rider for riding dependability, and Sprint 4T Extra for reliable performance.